Home » Rotary Wheels For Learning » Surpassing Our Goal – 1097 Bicycles Distributed in Cambodia by Rotarians and Friends! Surpassing Our Goal – 1097 Bicycles Distributed in Cambodia by Rotarians and Friends! During the month of January 2012, 1097 Bicycles were distributed to needy school children in Cambodia – Thanks to the amazing efforts of our team of 19 Rotarians and Friends and all the Rotary Clubs and individual donors who supported the cause with their donations. 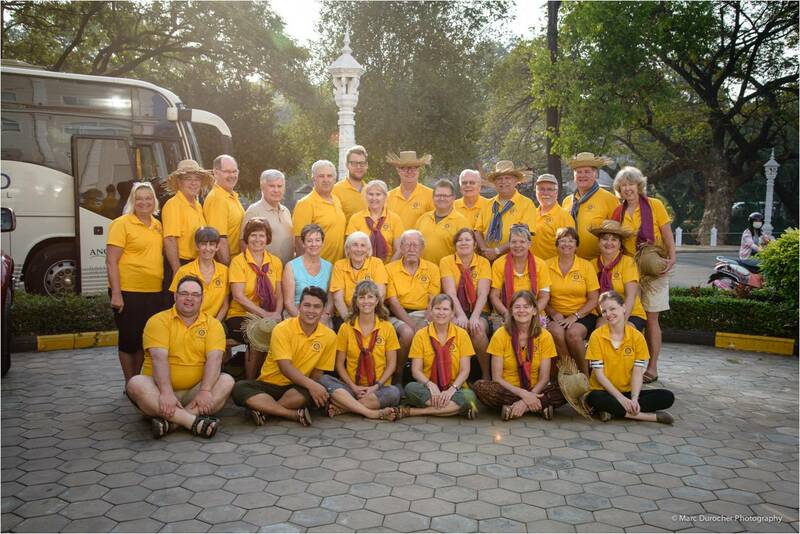 Our 19 Rotarians and Friends came from the Bracebridge and Gravenhurst Rotary Clubs, District 7010, Ontario, Canada. The bicycles were distributed through the Rotary Wheels for Learning (RWFL) program of the Rotary Club of Gravenhurst. 300 Bicycles in North Phnom Sampov village, Aek Phnom village, Thma Koul Primary School and Setoup Commune in Battambang province. 300 Bicycles in Koh Kralor district, including Takou Primary School. 197 Bicycles in Prokeab village, Takeo province. 110 Bicycles in Bakot village, Takeo province. 90 Bicycles to PIO children living near the Stung Meanchey garbage dump area in Phnom Penh. Preparing Bicycles for distribution – Affixing the baskets, pedals, bells, lamps and Rotary decals to the bikes, as well as pumping up the tires, adjustments and minor repairs. Each participant personally presented bicycles to the child and had their photo taken with them. It wasn’t all about bicycles either! – Our Team brought over suitcases of donated items that were distributed throughout our bicycle distribution locations. Many thanks toBarbara Seagram, Patti Lee and their Bridge Group from Toronto for their many donated items. Hundreds of tubes of toothpaste and toothbrushes were given out at some of our bike distributions! Trip team member Walter Ried (retired dentist) and local Cambodian Dentist Khom Pisal teamed up to give invaluable dental hygiene education sessions to hundreds of children and their families. The Rotary Clubs of Bracebridge and Gravenhurst also provided one ton of rice each to village areas in Battambang province. This was distributed through the Rotary Club of Battambang’s Rice Program. We immensely enjoyed our fellowship volunteering alongside Battambang Club members for two days, and feasting together at our gala poolside dinner. We were treated as VIPs at many of the distribution locations – grand ceremonies had been planned by local officials and schools thanking Rotary for their educational support through the provision of bicycles to school children lacking this necessary transportation to get to School. What a great opportunity is was to show ‘Rotary at Work’ in many rural impoverished areas that had never heard of Rotary before! During our 19-day trip around the central portion of the country, we saw many of Cambodia’s famed sites including: Angkor Wat, Toul Sleng Genocide Museum, the Choueng Ek Killing Fields and the Royal Palace. There was lots of shopping at local markets for everything including beautiful Cambodian silk, carvings and tourist fare! You, or your group of Friends, can join our January Cambodia 2013 RWFL Bicycle Distribution Trip! Email us for further details at: rotarywheelsforlearning@gmail.com .Your donation of $50 will provide a child with needed transportation for education. 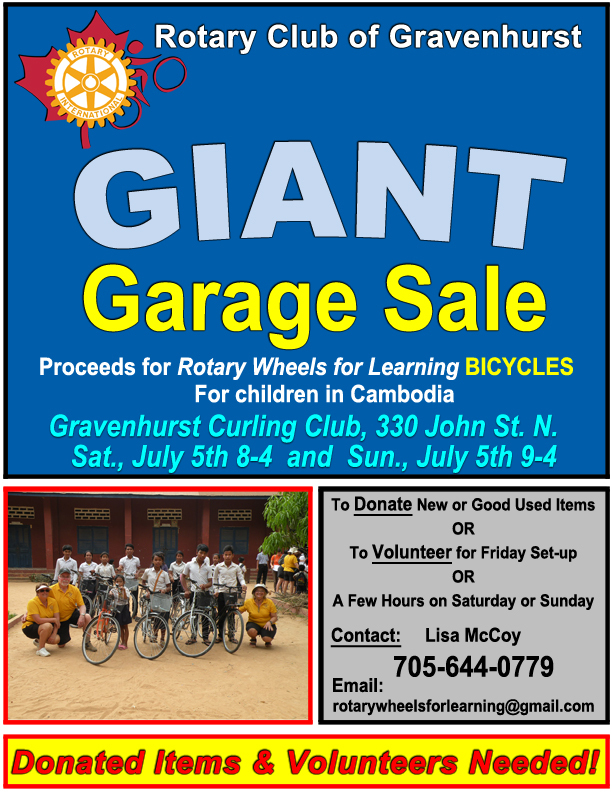 Previous What Gravenhurst Rotary is up to!